An old nemesis returns but only as a forbearer of something even more malevolent in the epic Weather Lord: Following the Princess! The power to command powerful weather systems are still yours as you set off on a journey to rescue a princess from captivity, rebuild a ravaged land, and stop a relentless force from destroying the magical Kingdom of Lorraine! As you progress, you'll help the natives by gathering resources, rebuilding their villages, and completing quests, using sunlight, rain, wind, and thunder to replenish crops, eliminate ghosts and bandits, and remove obstacles. You can complete these tasks however you choose: you can either work quickly to reap the best rewards, or take your time and enjoy the colorful graphics, captivating music, and addictive gameplay! 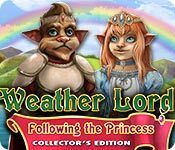 Weather Lord: Following the Princess Collector's Edition is rated 4.1 out of 5 by 18. Rated 5 out of 5 by Bumbles2 from Simply stunning game This is a story about a Warlock called Victor and a princess called Olivia and how a wee fairy from the kingdom of Lorraine begged them to come and help them....their Kingdom of Lorraine was being invaded by trolls, ghosts and many more evil things...its quite an adventure for these two!!! The graphics are wonderful ... the artists did an excellent job in putting this one together I'm amazed how beautiful some of it is...also the music is easy to listen to. The story is easy to follow too. I've really enjoyed playing this game...nice and relaxing with a few challenges thrown in here and there. I have only bought a couple of the Weather Lord games and I'll definitely be buying all of them. This has been an amazing game to play...have fun all !!! I definitely recommend this game...I think you'll love it as I do!!! Rated 5 out of 5 by graceland9 from Control the Weather! I loved the weather component of this TM game. Weather Lord is an original TM game on its own, complete with rainbow fairies you 'make happy' with rainbow crystals and frog princes who want gold to buy crowns. There's the usual construction - wood to collect, sawmills to build, grain to grow - but you get to control the weather. Drag the rain cloud over the wheat field, create more gold in the mine with a tornado, dry up swamps with the sun - plus you can get rid of those pesky ghosts with a blast of warm sunshine! Throughout you rescue a princess from a tower. It's not the most earth-shattering story, but it kept my interest. I just really enjoyed fiddling with rain, sun, and rainbows. You also find treasure chests that give you artifacts to use as you play. If you like TM, this is a good option for your summer trip or pool time. Rated 5 out of 5 by connieanddan from The best Weather Lord yet. I loved this game. I played it 4 times in a row. I have liked all of the WL games, but this one was more organized and gave the player more control and planning ability. The fact that you can choose to get rid of enemies on your own by using the elements is fantastic. The warriors were tedious and annoying. It seems less complicated to build houses and buildings in this one - not so many materials needed. It was just enough excitement to be relaxing. That is what I want in a game - not to pull neck and wrist muscles chasing monsters at breakneck speed. Bring on more like this one soon! I will buy every one. Rated 5 out of 5 by cjathome from One the best! Don't need to add much to what's already been said. This is a really great game with lots of challenges and well worth buying the CE version. Hours and hours of entertainment. Try it! Rated 5 out of 5 by TooOld2Play from A Must Have for Fans of the Weather Lord Series Really excellent sequel to the Weather Lord Series of games. This one is worth the CE if you can manage it, otherwise the SE will give you plenty of challenge. I can only say that this is the best of the bunch and another winner from this developer. If you are a fan of time management/strategy games, this one is a keeper. Rated 5 out of 5 by Linca1 from Getting there Good mix between weathherlords first game and other games that are more royal envoy made. I like the new mix! If only one thing I lack, is another choice than relaxed and expert.-Maybe something in between? Rated 5 out of 5 by gmac1007 from Today's Forecast : Stunning Artwork, Thundering Hammers And Raining Nails This Halloween sure has been a treat for time management fans two awesome ce's in one week Whoo - Hoo ! Let me start by saying the artwork in this game is simply breathtaking the colors are so bold and beautiful and I simply love the characters they have the half animal half human look to them something that not many games offer and I simply love it. Again with this game like the others the elements come into play and are the main tools in this game which again sets these games apart from others. With this latest edition there are some new elements that come into play. The story line is very cute you are off to save the fairies and rescue the princess fairy who is being held captive in her own castle. There are two modes of play expert and normal and the normal mode is the relaxed mode with no timers and you can switch playing modes if you want to. There are bonus levels separate from the main game and a strategy guide to help you along the way. Something new with this one are the artifacts when you find them they are boosters for your tools and before each level you can choose which one you want to take with you and I think you can take as many as three. Also there are bonuses which will appear down at the bottom of the screen and my all time favorite is being able to freeze time for a short period of time. As with all building games you are gathering resources, harvesting food, clearing debris and building buildings but unlike other builders with this one you are working with weather elements and they are possibly the most important tool you use in this game. 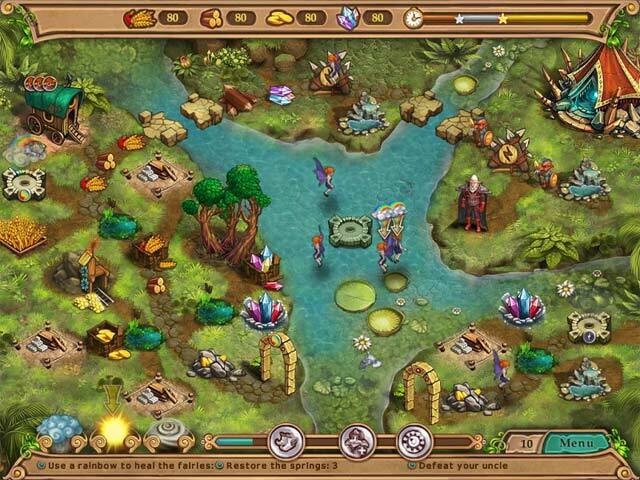 This game offers up a great challenge along with lots of eye candy and soothing music. Once again this dev. has got it spot on with this game and what I've played has been simply awesome and quite challenging early on but with the right amount of planning and use of the bonuses it can be done. For me this game is very story driven and it's stands out throughout the game our hero has one mission to save the fairies rescue the princess and I can't help but think that our prince is also looking for a princess to call his own and I think she may be waiting for him locked away in her castle tower and the only way to find out is to go save her and that is exactly what I'm gonna do because I can't wait to see the outcome of this one so I'm off to pack my lunch grab my trusty hammer and my bucket of nails because I got a lot of work to do. Give the demo a try it's a real treat. Thank you dev's for bringing us another gorgeous and challenging game and please continue to give us more because you do it so well and thank you Big Fish for giving time management fans a well deserved week for games and please give us more. Have fun everybody and Happy Halloween ! Rated 5 out of 5 by Justy1002 from Excellent addition to the series The planets must have aligned perfectly that TM fans received two TM games within days of each other. Yay! I'm a big fan of this TM series, the last of which was release back in May. There are two modes of play now, casual and expert. My review is based on expert mode. The previous installments didn't have this option. There are no multi-clicks on expert mode, so you can't send multiple workers to chop down a tree for example. There are other changes to the game, which I like. The main weather options, such as rain, sun, wind, are now a part of your taskbar at the bottom of the screen. They still have a short timer for regeneration after use, but they're all in one spot, which makes it easier to use. There will still be special clouds that appear on some levels as part of the terrain, but the main ones will be on the taskbar now. The build menu is also different now, in that you have a larger window which shows each building you can build, and how many resources are required to build. The previous menu was much smaller. Restoring the gold mine now requires the air cloud rather than sending a worker to rebuild it. Additionally, you now get rid of bad guys with clouds, rather than training soldiers at your camp. Artifacts have been introduced to the game and give bonuses such as the Axe, which gives you 40% more wood when collected. 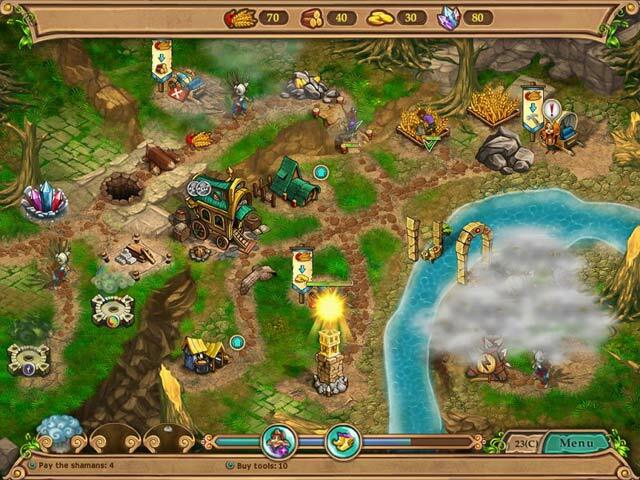 You can use up to three artifacts at one time, and your chosen artifacts will be shown on the resource bar at the top left of your screen. There are a total of 18 artifacts, and you can choose which ones you want to use at the beginning of each level (after you've found the first one). Character bonuses are now part of your taskbar and include run speed, extra resources, stop time, etc. Previously you had to build an altar to use these bonuses. There are 40 awards, with bronze, silver, and gold levels to each award. 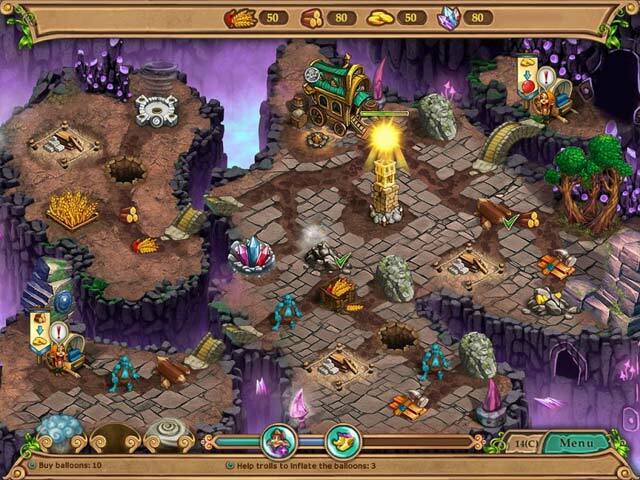 The premise is the same as the previous installments - collect resources, build buildings, defeat the bad guys. It's a wonderful game, which I think most every TM fan would enjoy. Demo for yourself and see!